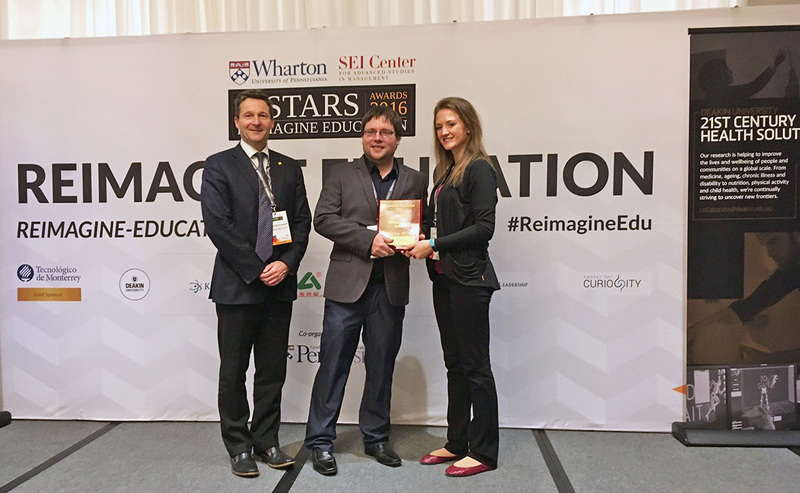 Duke’s Data+ summer research program received the gold prize in the natural sciences category at the Reimagine Education Conference and Awards in Philadelphia. Paul Bendich and Ashlee Valente accepted the award on behalf of the Data+ team at the University of Pennsylvania’s Wharton School. Hosted by Wharton and QS Quacquarelli Symonds, the global awards competition evaluates higher education projects that enhance learning and employability and are both innovative and scalable. Data+ is a ten-week interdisciplinary research experience that exposes undergraduates to modern data science in a peer learning community and provides professional development for graduate student mentors. Each Data+ team consists of two to three undergraduates, a doctoral student mentor, Duke faculty in the research area and a client. Clients provide real-world research questions and request deliverables. Students learn how to marshal, analyze and visualize data, while gaining broad exposure to the field of data science. Working in a communal environment, students learn from others within their teams as well as the larger Data+ community. Data+ is part of Bass Connections’ Information, Society & Culture theme. Last summer, approximately 300 students applied and 70 were selected to participate. Over 50% of the students enrolled in Data+ identified as female. New projects for Summer 2017 will be announced later this month. The Data+ program is part of the Information Initiative at Duke (iiD), of which Duke Engineering is a participating school. Explore Bass Connections in Information, Society & Culture. Find out how to get involved in Bass Connections.